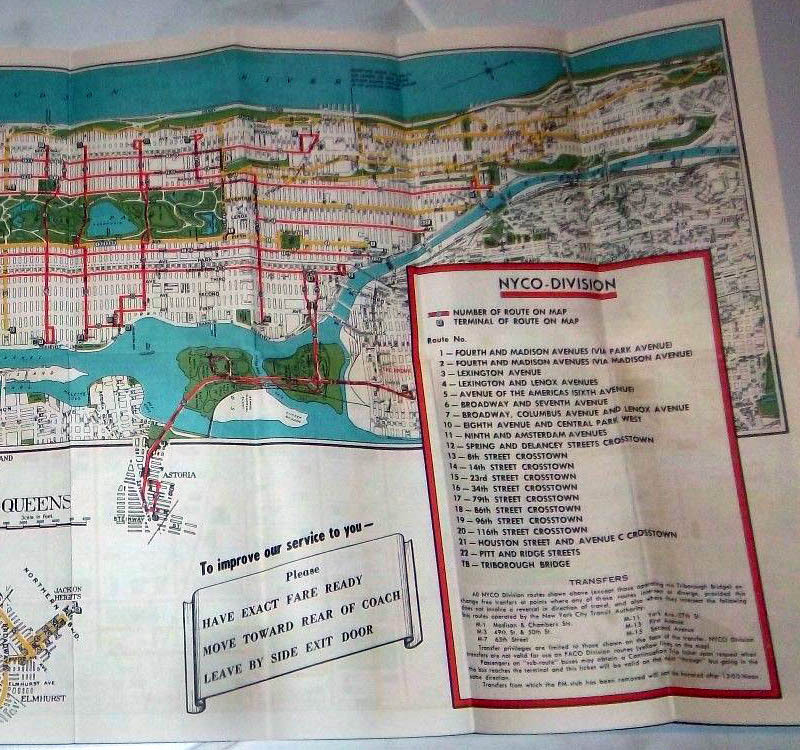 Everyone knows April 15, 1957 as the day on which Surface Transit's route M-105 - Tenth Avenue line, after years of being "jerked around" (moved to Eleventh and West End Avenues in 1948, truncated from the 125th Street Ferry to 73rd and Broadway in 1954), was reduced to one trip a day, as would hold until its final demise in 1962. 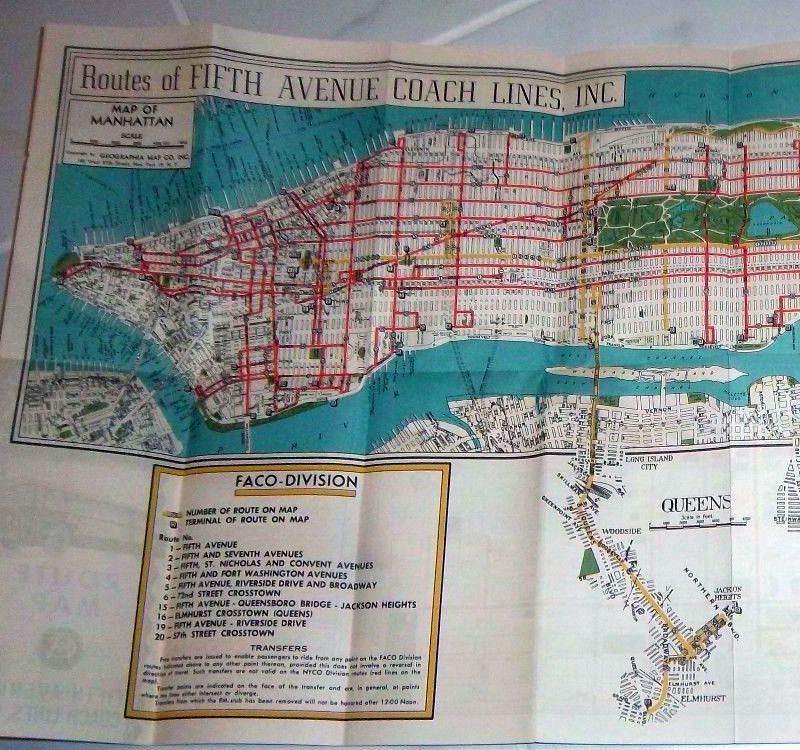 But I have to wonder if this was one of several service changes made on or about that 1957 date by them and their by-then parent, Fifth Avenue Coach Lines. 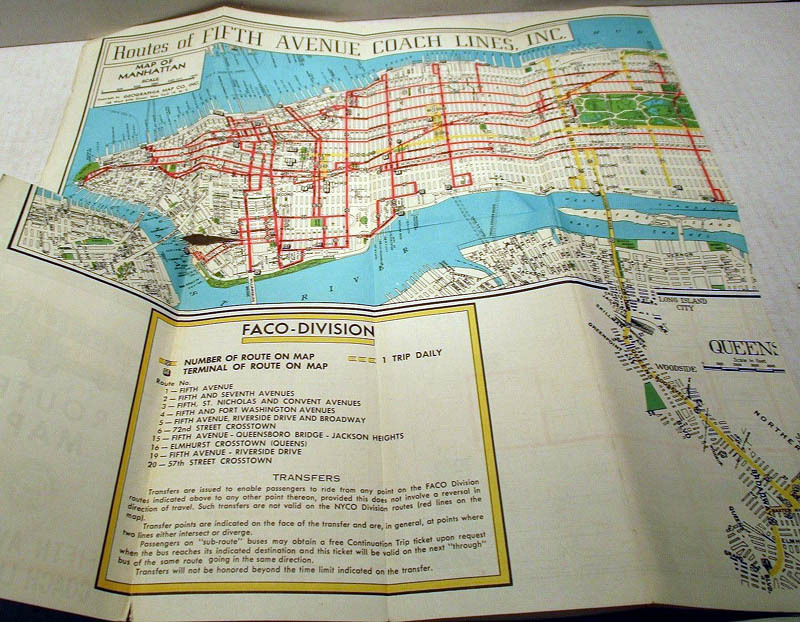 The key is in two different variations of FACL's route maps which were issued after the March 10, 1957 one-way conversions of Sixth Avenue between Herald Square and 59th Street; Broadway from Columbus Circle to Herald Square; and Seventh Avenue from 59th Street to Times Square. 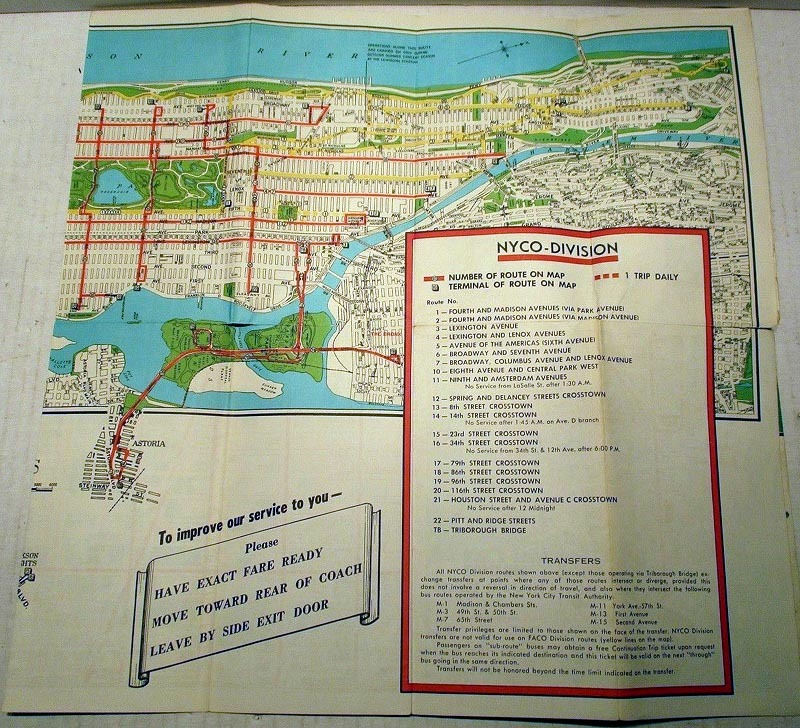 One had the routes shown straight by FACO and NYCO Divisions - and the other, presumably issued later on, mentioned several NYCO Division routes' service being truncated (i.e. no overnight service on 11, 14D or 21, reduced hours for the branch of 16 to 34th and 12th) - and two routes being presented as one trip daily: FACO Division's 1 and NYCO Division's 22. Would anyone on this board with knowledge of such history advise when exactly would such service cutbacks have been implemented along those routes? I know at the time, FACL was claiming that their revenues had dropped because of the countless one-way street conversions, and on top of it all there were air pollution controls being imposed on the city (of which FACL was found to have had the best record among the bus companies operating in the city). I am sending separate posts, one with each before and after, and would appreciate any analysis as to what came when. M 101 3rd Avenue-Lexington Ave.-Amsterdam Ave.
As well as M 105 being in the "One Trip Daily" categorization.